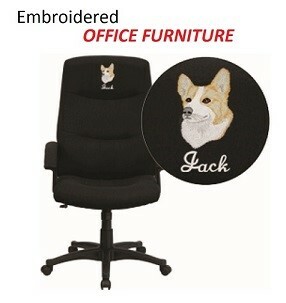 Embroidered furniture adds a touch of personality to your office. We have a catalog full of furniture that can be custom embroidered with your logo, name, or picture that lets people know who you are. What's nice is if you only need one chair, we can do that for you. The minimum quantity is one, so why not get custom chairs for all of your favorite people. Great ideas for retirement or going away gifts. We have a line of children friendly pieces available too. So, birthday or holiday presents with a personal touch is at your finger tips. Remember bean bag chairs, they come in many colors.